Flour & Flourish is located in beautiful Utah, USA. I work primarily in Utah and Salt Lake County but I would love to travel for you! Yes you can! Tastings are by appointment only and are held twice a month on scheduled days. The price of the tasting is $15 per person (I recommend no more than 4 people-too many opinions!) and must be paid in advance via credit card. If you end up booking with me the price of the tasting goes towards the price of your cake. Tastings last 45 minutes. At the tasting, you will try 3 flavors that you have chosen ahead of time and we will discuss details and design. 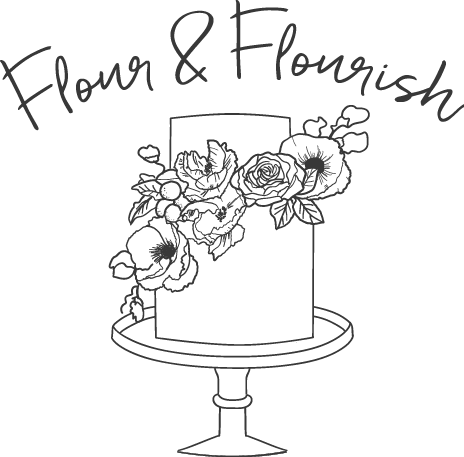 What makes a Flour & Flourish cake so awesome? Each F&F cake is completely homemade, everything from the caramel to the fruit puree used in my cake fillings. My cakes are completely made from scratch. No cake mixes around here! I use butter in my cakes and butter in my butter-creams. No oils or shortenings are used. These have no flavor so why would I use them? I’ve been making cakes for almost 10 years and I know my stuff. Your cake will be beautiful, sturdy, and taste amazing. If you know you will be getting married during wedding season (April-October) you should reach out to me as soon as you have your date set. Due to extremely busy times of the year I could be booked as early as 6 months in advanced for a specific day. Please note that a nonrefundable fee of $100 is required to hold your date and will be applied toward the total cost of your cake. Wedding cakes booked 3 weeks in advance must be paid in full. For smaller orders such as birthday cakes or macarons, 3 weeks notice is preferred. Do you offer other desserts besides cake? I offer a wide range of finger dessert options such as French macarons, dessert shooters, shortbreads, mini pies, marshmallows, meringues, cookies, and brownies.